Remove the captions for the rows. To do so, clear Row Caption. Specify which listing to use for this pivot table. To do so, select a listing from the Listing drop-down menu. Specify the maximum number of records to include in listings for this pivot table. To do so, specify a value for Maximum Listing Rows. The default is 1000. This style definition specifies that the font is in 12 pt, blue Verdana on a pale green background. The text is also bold and center-aligned. 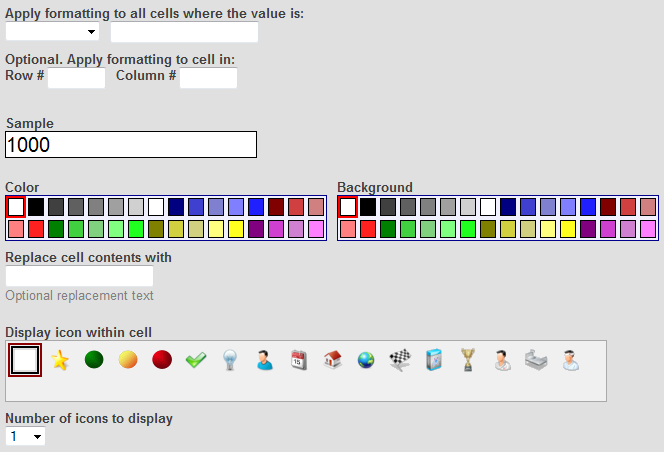 If you specify a custom color for the cell background in Cell Options, the system ignores the Zebra Striping option. Use the Span Labels options to control whether labels are spanned. Use the Show Empty options to control whether empty rows and columns are displayed. Control the size of the data cells. To do so, type the width in pixels into Width and the height in pixels into Height. If you have enabled the %SQLRESTRICT dimension for a cube, you will see the SQL Restriction field. If you wish to apply an SQL Restriction for the current pivot table, enter a valid SQL SELECT statement or WHERE clause. For more information, see the %FILTER Clause section of the InterSystems MDX Reference. The Analyzer displays Advanced Options button in the Rows, Columns, and Measures boxes, next to each item in those boxes. The same button is also available for the Rows and Columns boxes. The following sections describe changes you can make. Wherever possible, all the formatting is used. For example, if you specify the typeface to use for rows and the color to use for columns, both of those format options are applied. Formatting specified for a measure in a pivot table takes precedence over formatting specified elsewhere. Formatting specified for columns takes precedence over formatting specified for rows or the entire pivot table. Formatting specified for rows takes precedence over formatting specified for the entire pivot table. Formatting specified in the pivot table takes precedence over formatting specified in a measure definition (other model elements do not have format options). Click the Advanced Options button next to the item. You might also want to specify a different caption; see “Specifying New Captions,” later in this chapter. Type an MDX set expression into MDX Expression. For information, see Using InterSystems MDX. 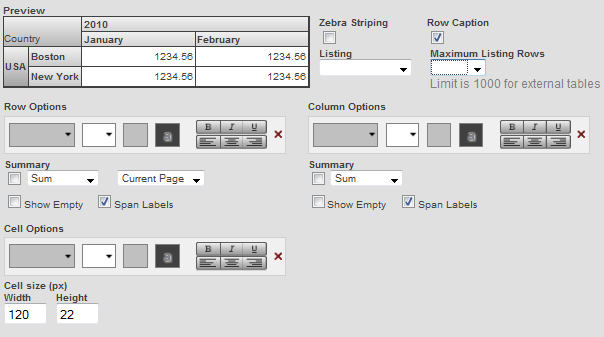 Click the Advanced Options button next to the item or in the header of the Rows or Columns box, as appropriate. Type a value into Caption. To include the original name in the caption, use an asterisk (*) at the appropriate position. Click the Find button next to Format. Positive piece specifies the format to use for positive values. Negative piece specifies the format to use for negative values. Zero piece specifies the format to use for zero. Missing piece specifies the format to use for missing values. 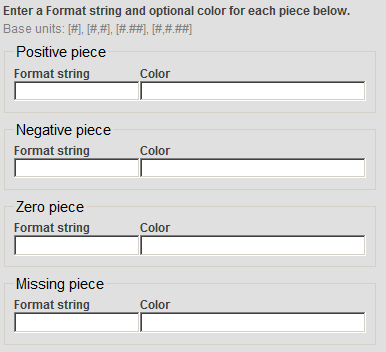 In each of these, Format string specifies the numeric format, and Color specifies the color. Specify values as needed (see the details after these steps). You can include additional characters before or after the base unit. A CSS color name such as MediumBlue or SeaGreen. You can find these at https://www.w3.org/TR/css3-color/ and other locations on the Internet. A hex color code such as #FF0000 (which is red). An RGB value such as rgb(255,0,0) (which is red). This style definition specifies that the header is in 12 pt, blue Verdana on a pale green background. The header is also bold and center-aligned. Click the Advanced Options button next to a level or named set or in the header of the Rows or Columns box, as appropriate. Filter members  Select this to filter the members by a measure value. Then select a measure and a comparison operator and type a value. Sort members  Select this to sort the members. Then select the measure by which to sort them. Click Ascending or Descending to control how the members are sorted. Return the first n members  Select this to select a subset from the beginning of the set. Then type an integer into Count. When you use this option, the system first uses any settings you specified for the Filter members and Sort members options. For any cell in a pivot table, each measure is aggregated from the lowest-level data. Aggregation methods include sum, average, maximum value, and others. By default, the system uses the aggregation method specified in the measure definition. You can specify an alternative method. Similarly, if you add a summary row or column, you specify how to aggregate the displayed values into a single number for that summary row or column. You can specify an alternative method for this as well. Click the Advanced Options button next to the measure. Measure Aggregate specifies how this measure is aggregated from a set of values in your data. The choices are SUM, AVG, MIN, MAX, and COUNT. Total Override specifies how the displayed measure values are aggregated for any summary rows or columns. The choices are Sum, Count, Min, Max, Average, % of Total, and None. See also “Adding a Summary Row or Column,” earlier in this book. Click the Advanced Options button in the header of the Rows box. Expand the Drilldown Options group if that is collapsed. Type the expression directly into Drilldown Expression. Use the Expression Builder. To access this tool, click the plus sign next to Drilldown Expression. The left area lists the contents of the cube, including all measures and levels. The right area displays the expression that you are creating. To add an item to the expression, drag and drop it from the left area to the expression. The item is added to the end of the expression, and you might need to move it to a different part of the expression. Typically you use set expressions of the form [dimension].[hierarchy]. [level].MEMBERS, where dimension is the logical name of a dimension, hierarchy is the logical name of a hierarchy, and level is the logical name of a level. This expression represents the members of the given level. If these identifiers do not include spaces, you can omit the square brackets. Also, the expression is not case-sensitive. The first set expression controls what happens when the user double-clicks the first time. Specifically, when the user double-clicks the first time, the system creates a new query that uses this set expression for rows and that is filtered to the given context. Similarly, the second expression controls what happens when the user double-clicks the second time, and so on. The Drilldown Expression option overrides any other drilldown behavior in this pivot table. That is, if a level is in a hierarchy, the hierarchy drilldown behavior does not occur for this pivot table. For an example, see “Custom Double-Click Drilldown,” later in this book. The same option is available in the Advanced Options button in the header of the Columns box. This option is ignored by default but is used if you pivot the table (via the Transpose button ) and then perform double-click drilldown. You can apply conditional formatting, which can add color, text, or graphics to pivot table cells. 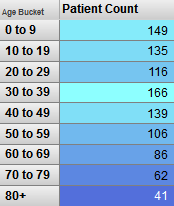 To do so, you create rules that examine the values in the cells. 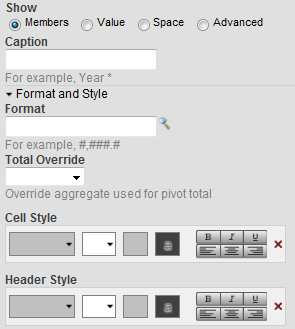 This conditional formatting overrides any customization you added to the pivot table. Clear all conditional formatting. To do so, click Clear rules. Change the order of the rules. To do so, click the up or down arrows in the row for a rule. Delete a rule. To do so, click the X button in the row for that rule. Reconfigure a rule. To do so, click the Reconfigure button in the row for that rule. Apply the existing rules while leaving this dialog box open. To do so, click Apply. Apply the existing rules and exit this dialog box. To do so, click OK.
Close this dialog box without making changes. To do so, click Cancel. Rules are applied in the same order that they are listed here. If a later rule contains formatting information that is inconsistent with an earlier rule, the system uses the formatting specified in the later rule. For each cell where this rule is true, the rule is applied. 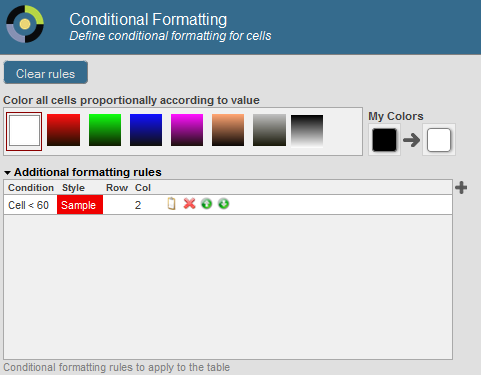 All the display details of the rule are applied to that cell. Select an operator from the first drop-down menu. Type a numeric constant into the field to the right of that. Optionally specify which row, which column, or both the rule applies to. To do so, type a number into Row #, Col #, or both. Optionally specify the text color to use when the rule is true. To do so, click a button in the Color section. If you select the left-most button, the system uses the default color. Optionally specify the background color to use when the rule is true. To do so, click a button in the Background Color section. If you select the left-most button, the system uses the default color. Optionally specify replacement text to display when the rule is true, instead of the actual cell value. To do so, type text into Replace cell contents with. If you select the left-most button, the system does not display an icon. To display multiple icons, click a number from the Number of icons to display list. The bottom of the dialog box shows a preview of the formatting. Display that pivot table in the Analyzer. Click the Print Options button . Specify options as described in “Customizing Print Settings for a Widget” in Creating Dashboards. For comments on printing, see “Printing Pivot Tables,” later in this book. Note that when you create dashboards, you can specify print settings in the dashboards as well. See “Customizing Print Settings for a Widget” in Creating Dashboards. The system then displays a dialog box that displays the query used by this pivot table. If you want to use a different query, click Manual Mode. Edit the query. See the following subsection for an example. When the Analyzer displays a pivot table that is defined by a manually edited or manually entered MDX query, the Query Text button changes to the following: . Also, the Rows, Columns, and Measures boxes are grayed out. You cannot use locally defined calculated members unless you also add the appropriate WITH clause to your query. You can, however, drag items to the Filters box; the system applies these filters but does not modify the manual query text. That is, the base query and its filters are stored separately within the pivot table definition. You can also use the Query Text option to copy and paste the query (for example, to use in the MDX shell). The first argument specifies the set of members to use. The second argument specifies the percentage. The third argument (omitted in the preceding example) specifies the measure to use for ranking the members. For details on MDX, see Using InterSystems MDX and InterSystems MDX Reference.